The Kia Nero plug-in hybrid will impress. It’s a segment that is likely to rocket in popularity in coming months and years and the new Kia Nero plug-in hybrid delivers practicality and low emissions. Indeed, the car which goes on sale later this year, promises an all-electric range of more than 34 miles and when used with the engine, the firm says overall emissions will be less than 30g/km. For potential owners of a practical crossover those are figures that will attract their attention. Indeed, the Kia Nero plug-in hybrid has a high capacity lithium polymer battery pack producing 8.9kWh and a 1.6 litre petrol engine as well. There’s plenty of space on board with a spacious cabin and 324 litres for the boot. 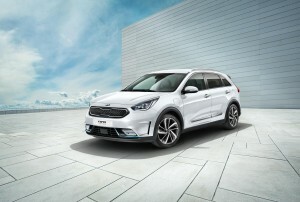 Alongside the low running costs, Kia have also added advanced energy saving measures and some styling tweaks to boost economy. For those who need it, the car also comes with the rare option for a crossover of a towing pack with a capacity of 1300 kg. Unveiled at the Geneva motor show, the Kia Nero plug-in hybrid is a versatile and practical choice and with the battery placed beneath the floor, the car offers plenty of space and practicality for families. There’s also a dedicated space for the charging cable when the owner is not using it. Kia already produce a hybrid of what is an excellent crossover vehicle and the new plug-in variant comes with 16-inch alloy wheels, eco-plug-in badging and the exterior has been designed to reduce wind resistance. The market for plug-in hybrid vehicles across Europe will, by the end of 2023, grow in size to sell more than 600,000 vehicles every year. There’s a clear demand for customers that are wanting the current trend of a compact crossover that will deliver ultralow emissions and an advanced plug-in powertrain. Essentially, the Nero plug-in hybrid will be the only vehicle available to offer this combination though it’s highly likely rivals will quickly step into the market with similar offerings. More facts and figures relevant to the Kia Nero plug-in hybrid will be revealed closer to its actual launch so the all-electric range may well improve but for those looking for an excellent commute car then this vehicle should be worth considering. This entry was posted in Car Leasing, Cars, Hybrid Car, New Cars and tagged Kia Nero plug-in hybrid by Steve Lumley. Bookmark the permalink.